We believe the Home is a place that creates feelings of peace and safety. In essence, Home is Sanctuary. We can support you in making your home that place by creating a design customized to the needs of you and your family. We specialize in establishing a design that reduces waste, increases efficiency and adds more vibrancy to your life. Our aquaponic systems are custom designed, from small to large scale. The functions of our systems are to provide food and beauty indoors, year round. 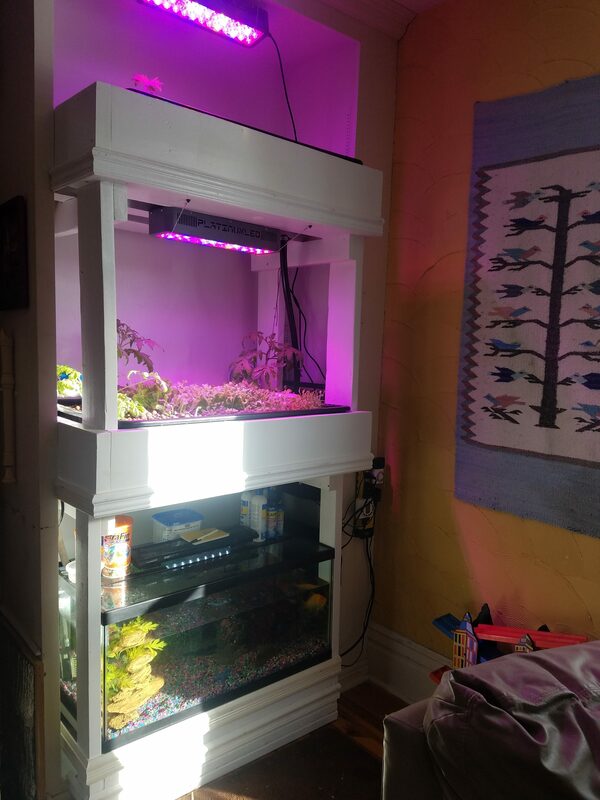 Click here to check out our Aquaponics Vlog. Are you tired of drafty houses and high utility bills? We find the leaks, electricity drains, and identify patterns of inefficiency, to design a plan for optimizing your home and lifestyle. We can also implement the design that best suits your needs. Imagine the fresh aromas of your favorite herbs filling your kitchen. You pinch off a leaf and add it to the dish you are making. We can help make this a reality through custom designing and implementing a kitchen garden for you. Indoor composting is a much more attractive idea to most living in the north. After all, how else can one generate valuable compost and liquid fertilizer with little to no energy during the winter months? We can help you find and apply the best worm bin system for you current floor plan. Whether you want to a better energy flow in your home, more passive solar, increased efficiency, or cleaner air, we can help you. We specialize in working with our clients to establish green systems. Find out today how you can make your house even better. Indoor air quality is often more polluted than the outdoor air, yet many people spend an average of 90% of their time inside. We offer air quality assessments to help you understand the unique situation of your home, then we create an air purification plan. Lets make your home green. A green home is a type of house designed to be environmentally sustainable. Green homes focus on the efficient use of energy, water, and building materials. A green home may utilize sustainably sourced, environmentally friendly, and/or recycled building materials. It may include sustainable energy sources such as solar or geothermal, and be sited to take maximum advantage of natural features such as sunlight and tree cover to improve energy efficiency. A green lifestyle incorporates systems of food production and health into the home taking your green house to the next level. We are dedicated to the use of green products in all of our eco-interior designs, giving you a beautiful home that you can feel good about. We also create organizational systems that help you keep your home clutter-free. 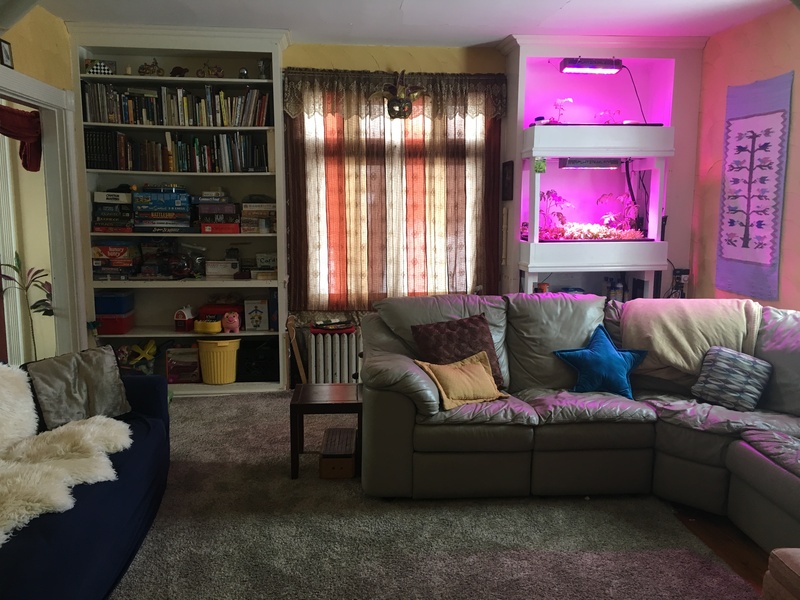 These systems look good and are highly functional, offering you the opportunity to live your life with less stress and give you more time to focus on nurturing the living systems that sustain you, such as the kitchen garden or the aquaponics system in your living room. Grow herbs, food, beautiful flowers, or air cleansing plants in the comfort of your own home. We can help you design the perfect garden for whatever needs you have for your space. We also set up the systems of maintenance to make your indoor garden easy and rewarding. We start with an assessment of the quality of your indoor environment, then we create a design for the healthiest home for you and your family. We then help you implement the design and can even maintain systems for you if you prefer, otherwise we give you a maintenance plan to care for your home. Clutter can make the most beautiful home feel chaotic. Often times, the the difference between chaos and organization is a matter of creating systems for the stuff in your life. We specialize in creating easy to maintain organizational systems that can help you keep your home clean and your mind at ease. Contact us today to get a consultation for your home, yard, or farm. We have 13 years of experience in Permaculture design and would love to support you in creating a space that enhances your connection with nature.